My role is to be the @virtualstowaway on Ellida and report to you, via the boys, what is happening between oar strokes. 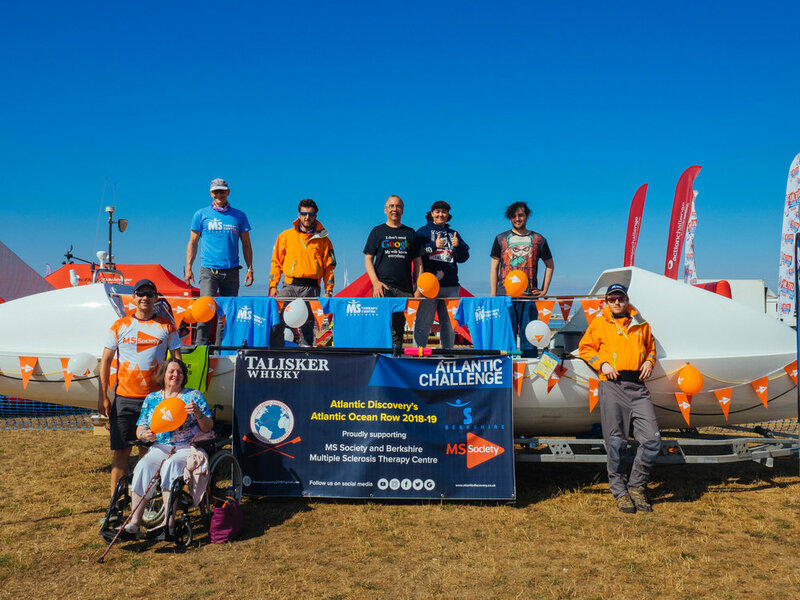 This weekend, Ben, Cam, Isaac and Jack rowed 60km along the stunning Jurassic Coastline to raise awareness and much needed funds for Multiple Sclerosis. I was off in the mountains of Wales, so this is my first 'reported' blog. So, to start, the logistics were a challenge. Friday night, after a long, hot week, you're dreaming of a cold beer, right? Sorry, none of that for Atantic Discovery. 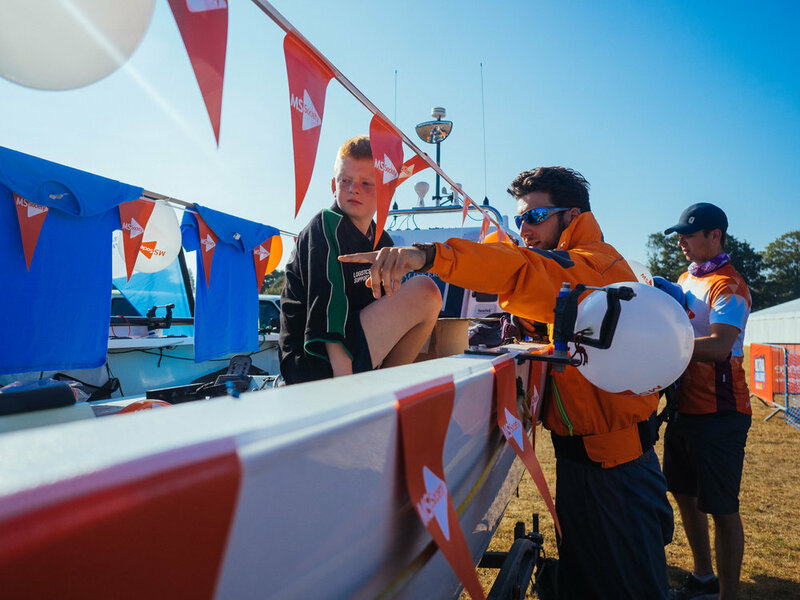 The team had to drive nearly 300 miles including airport pickup, essential kit in Bath, and tow the beautiful Ellida from Weymouth to Poole Harbour - arriving at 4am. Then, it was straight to work to set up shop: banners, balloons and flags to show the lady off to the 2,000 runners and walkers taking part in the Jurassic Coastal Challenge. The lovely ladies representing Berkshire MS Therapy Centre Samantha Hall and Yvonne Parks. The MS Society's enthusiastic representative Caroline Kew. 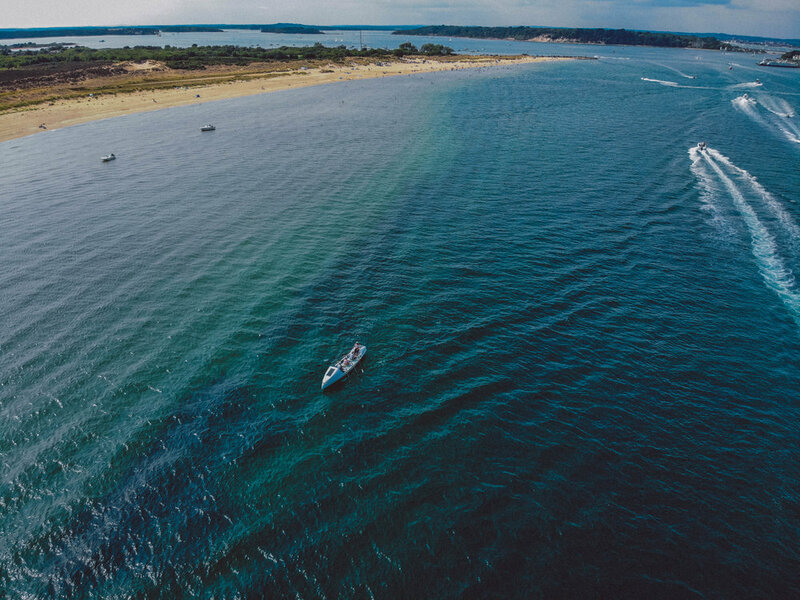 At midday, to coincide with wind and tides, Ellida was craned into the water and the boys navigated out of Poole Harbour and met up with adventure photographer Daniel Gregg Williams on the beach to get footage of the boat and crew from the air. The team rowed three-up for the first time and were quite pleased with the speed they achieved. Dan bagged some exceptional images which have performed incredibly well on our digital platforms (including the images featured in this blog) - more kudos and followers for this extraordinary journey. Thank you Dan! Your support means a great deal to the team. The team pulled together, when things got tough. They are all really feeling good this week. Go boys! 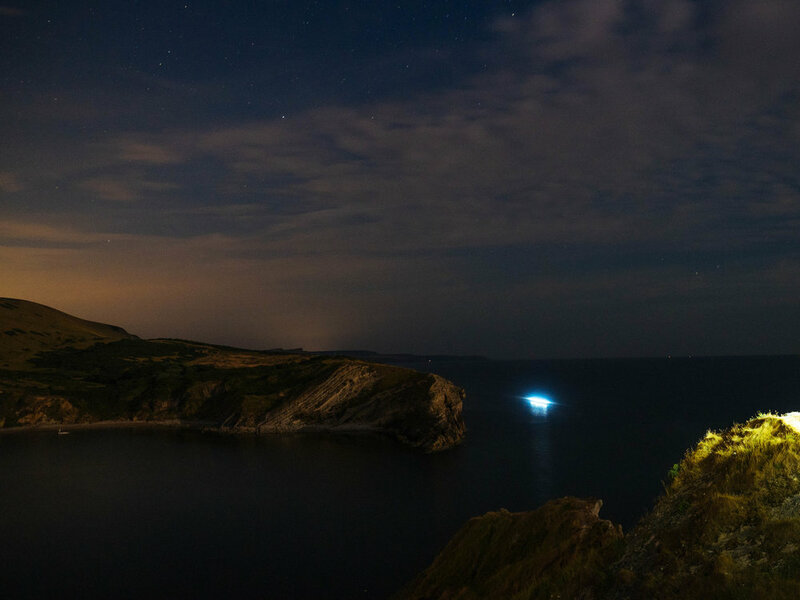 Ellida rowing into Lulworth Cove at approximately 11pm on Saturday night.